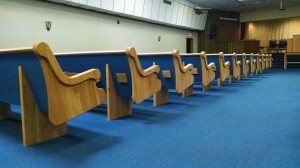 Born Again Pews headed to Lawton, Oklahoma, not far from our home, to install new custom church furniture for St. James Baptist. Lawton was established on August 6, 1901, when a lottery was held to distribute the plots of land among about 164,000 would-be homesteaders who had registered for the land there and in two other districts established by an agreement between Native American leaders and President McKinley. 6,500 lucky winners got homesteads. One of the original homesteads still exists at least in part, in the form of the home of Mattie Beale, built in 1908. It is on the historic register and is open to visitors. Lots within the city limits were sold at public auction, and the town sprang up quickly – so quickly that it had no government until October. Even then, life was hard in the city, which had 25,000 people still living in tents as they built their homes. There were no streets, there were not enough schools, and there wasn’t even enough clean water to go around. Those rough times are long past, and Lawton, Oklahoma is now a thriving town. St. James Baptist now has beautiful new pews upholstered to match the carpet as well as a matching altar table. Born Again Pews specializes in custom church furniture, so we can easily build pews and other church furniture that will create a harmonious effect in your sanctuary. 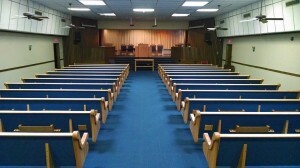 When you need new church furniture, from pews to pulpits to altar tables to extras, Born Again Pews is ready to help. 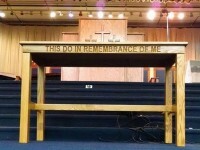 We build all our custom furniture from solid oak, and we will bring it to your church ourselves and install it. It’s our job, our mission, and our pleasure to help churches large and small get the church furniture they need at a price they can afford. Call us today, or ask for a free quote.